Federated with the University of Toronto, St. Michael’s provides a world-renowned undergraduate experience in the heart of Canada’s leading research university. Students come to St. Mike’s from all over the world to study with the best scholars in their fields while also enjoying a tight-knit community. 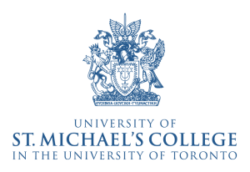 At the end of your career here, you will join other St. Michael’s alumni—Prime Ministers, CEOs, Olympic gold-medalists, and globally-recognized scholars among them—in receiving a degree from the University of Toronto.